Former Salvadoran president Francisco Flores died today, after going into a coma a week ago when he suffered a cerebral hemorrhage. His death came in the middle of his prosecution for corruption charges based on revelations that he had misappropriated $15 million in earthquake relief funds and used them for political purposes. Flores was El Salvador's president from 1999-2004, elected on the ticket of the right wing ARENA party. His time in office included the change of the country's currency to the US dollar, two massive earthquakes in 2001, attempts to privatize various public sector services, a close relationship with the Bush administration, and rising gang violence. The following post originally appeared on the website of Insight Crime. The United Nations has announced the creation of a US-financed anti-graft program in El Salvador, underscoring the United States' resolution to tackle corruption in Central America's gang-plagued Northern Triangle region. On January 25, the United Nations Office on Drugs and Crime (UNODC) announced the establishment of an anti-corruption program in El Salvador, reported Reuters. The program will work with existing institutions by training Salvadoran officials to detect and investigate cases of corruption, reported El Diario De Hoy. However, the program will lack the broad investigative powers enjoyed by the UN-backed anti-impunity commission in Guatemala, the International Commission against Impunity inGuatemala (Comisión Internacional contra la Impunidad en Guatemala - CICIG). "This is not the CICIG," said Monica Mendoza, a UNODC representative who will oversee the program. Former president Francisco Flores in coma after cerebral hemorrhage. Flores has been under house arrest and on trial for corruption when he had a stroke. He is reportedly in critical condition and in a coma following emergency surgery. Sanchez Ceren changes top security officials. El Salvador's president replaced his top public security ministers this week. The new minister of public security is Mauricio Ramírez Landaverde, and the new head of the PNC is Howard Cotto. The president indicated that he made the changes because he wants to see results in the war against gang violence in the country. El Salvador health minister advises women to delay pregnancies until 2018. The spread of the mosquito-borne Zika virus which is linked to brain damage in unborn children has prompted the unusual health warning in El Salvador and five other nations. He was elected less than a year ago, but Nayib Bukele is already a different kind of mayor for San Salvador, and people are noticing. At the end of last year, mayor Bukele was named by Forbes magazine's Mexico edition as one of the 25 most influential people in Central America for 2015. The thirty-four year old businessman turned politician was easily elected in 2015, carried on a wave of popular support by the young people in the city. Although Bukele ran as a candidate of the FMLN, he distanced himself from the party in a campaign focused on his own charisma and ideas and not based on party affiliation. El Salvador is saying good-bye to US Ambassador Mari Carmen Aponte. The Ambassador, who was appointed by president Obama, is ending her five years of service to El Salvador. She has been appointed by the US president to be the new permanent representative to the Organization of American States, but that nomination is still pending confirmation in the Senate. The airwaves in El Salvador are currently filled with government public service announcements on how to control mosquito-borne diseases. And for good reason. Diseases transmitted by mosquitoes in El Salvador include Chikungunya, dengue and now the Zika virus. Chikungunya and dengue infect tens of thousands of Salvadorans each year, and Zika is spreading quickly. According to an article in La Prensa Grafica today, the country's social security health system (ISSS) treated more than 60,000 people in 2015 and the beginning of 2016 for Chikungunya, dengue and Zika. This would be only a portion of the population suffering form these diseases, since ISSS covers only those person with formal employment. Almost 40,000 persons were treated for chikunguya and 14,000 for dengue. 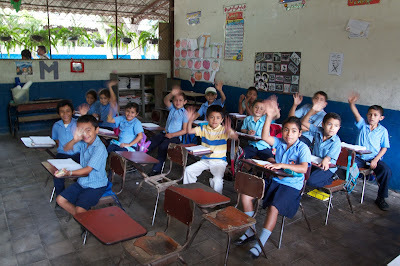 This week marks the beginning of a new school year for most students in El Salvador. In an article titled Education Reform in El Salvador: Progress and Challenges, the Council on Hemispheric Affairs looked at the state of the education system where those students will be learning. Today, El Salvador has a population of about 6.1 million. Some 1,470,000 students were enrolled in primary and secondary school in 2014. That El Salvador has a large student population and a significant number of young people not attending school puts considerable pressure on the government to dedicate resources to improve school infrastructure, enrollment rates and security for students. January 16 was the 24th anniversary of the signing of the Peace Accords which ended El Salvador's civil war which lasted from 1980-1992. In the official commemoration of the event, president Salvador Sanchez Ceren asked for forgiveness from the victims and their families who suffered at the hands of the country's armed forces during the conflict. He described the creation last year of a new registry of the victims which may enable them to receive reparations from the Salvadoran state. El Salvador's civil war resulted in the deaths of 75,000 civilians or more. The war was marked with human rights violations and massacres with names like El Mozote and Rio Sumpul and Santa Cruz. No post-war judicial proceedings have ever been conducted in El Salvador against those responsible for ordering those crimes against humanity. And so 24 years after the signing of the Peace Accords, the victims continue to search for justice. It has been common to say that 2015 was the bloodiest year in El Salvador since the end of the civil war. But was it? In comparison, 2015 homicides totaled 6,640 for a homicide rate of 104.2 per 100,000 with a higher population twenty years later. Thus it is incorrect to state that 2015 was the bloodiest year for civilians since the end of the civil war. It was just the bloodiest year of this century. Central America is at the gates of a wave of deportations of its undocumented citizens in the US which will aggravate the precarious situation of the region and could lead to a "certain death" for thousands who left fleeing the gangs. This is the opening paragraph from an article in El Salvador's leading newspaper La Prensa Grafica on Sunday. This paragraph highlights how Salvadorans are viewing the raids by US immigration authorities starting New Years weekend which rounded up Central Americans who were under orders of deportation. The news coverage of these immigration raids at migrant's homes and the subsequent deportations has been constant. This is our annual year-in-review guest post from Carlos Colorado, author of the Super Martyrio blog, and expert on all things related to Oscar Romero. Here is a roundup of what I consider the top ten religious stories in El Salvador for 2015. As always, more than purely religious stories, I sought to canvass the year’s news for stories that show how El Salvador’s soul was tested and (sometimes) soothed last year. 2. Officialdom balks at bold IPAZ peace initiative. The carnage caused by the Salvadoran gang problem is the worst since the Civil War, but the idea of negotiating with the gangs has proven to be too much of a bitter pill for society and elected officials to accept. El Salvador has a new attorney general. Douglas Arquímides Meléndez Ruiz was sworn in yesterday after a long process of political negotiation and the vetting of candidates by the National Assembly. Because the election of an attorney general requires a super majority vote in the legislature, both the FMLN and ARENA have the ability to block any candidate they do not approve of. The National Assembly had dragged its feet in selecting a new attorney general, leaving the country without an official attorney general since early December when the term of Luis Martinez expired. Douglas Meléndez was the only name to appear on the list of acceptable candidates for all 5 political parties in the National Assembly and was subsequently elected with 83 of 84 possible votes. In a press conference after being sworn in, the new attorney general emphasized a need for transparency, but would not comment on pending cases until he had a chance to review them. 1.Soaring homicide rate. The leading story in 2015 from El Salvador was the soaring homicide rate. The country closed the year with 6640 homicides, up 70% from the year before. It was the highest rate of homicides since the country's civil war which lasted from 1980-1992 and made El Salvador the world's deadliest country not engaged in a war. A significant portion of the homicides was gang-related -- whether gang against gang, gang against innocent victim, or confrontations between police and military and the gangs, including extra-judicial executions of suspected gang members.